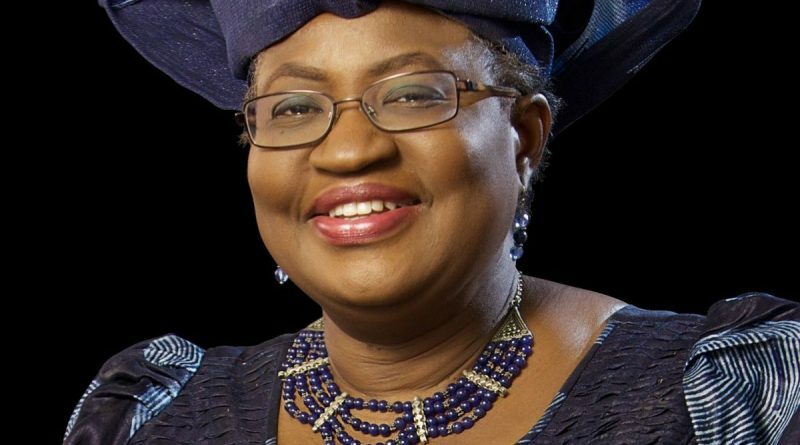 Nigeria’s former finance minister Ngozi Okonjo-Iweala has been appointed to the board of Twitter. Okonjo-Iweala served as minister of finance and coordinating minister for the economy of Nigeria under president Goodluck Jonathan from 2011 until his government was voted out in March 2015. Prior to that, she was the minister of finance under president Olusegun Obasanjo from 2003 to 2006. “As we strive to build a better world for tomorrow, Twitter can amplify messages and drive critical conversations around today’s most important issues,” said Okonjo-Iweala in a statement. 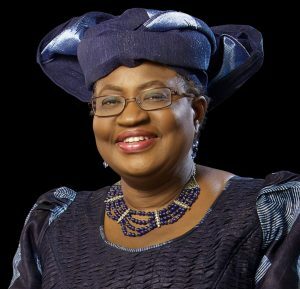 Okonjo-Iweala, a long-time, well-respected World Bank official, lost some of her shine after the Jonathan government was widely discredited by corruption scandals and mismanagement during one of Nigeria’s most lucrative oil revenue booms. Okonjo-Iweala, who is a fixture at Davos and similar high-profile economic and development events, has been at pains to distance herself from the Jonathan-era misdeeds. She recently published a book called Fighting Corruption is Dangerous: The Story Behind The Headlines which regales her experiences in government. Her appointment comes as large Silicon Valley companies, like Twitter, face ongoing criticism for a lack of diversity in their executive ranks and boards. Twitter has three women on a board of 10 (Okonjo-Iweala is replacing Marjorie Scardino, the former chief executive of Pearson). Her appointment also means there are now two black women directors, the other being Debra Lee, recently the chief executive of BET Networks. The company itself has acknowledged it needs to improve diversity in its ranks and has ambitions to increase the percentage of female employees in the company to 43% by 2019 from 38% at the end of 2017. It has also committed to increase the percentage of black and Latino employees to 5%; both groups each represented 3.4% of Twitter’s staff at the end of 2017. 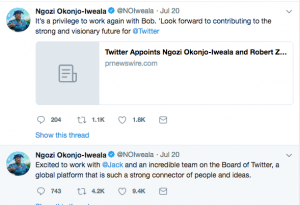 Okonjo-Iweala, who has over 860,000 followers on Twitter, is not a prolific tweeter, but neither is Twitter’s other new appointee, Bob Zoelick, who was previously president of the World Bank. Zoelick just joined the social-media platform in February and has yet to tweet. Twitter CEO Jack Dorsey tried to defend the idea that board members needed to be regular users of the platform. Twitter, which had 336 million monthly active users globally in the first quarter, is popular in Africa, particularly for discussions around politics. Prominent leaders like Rwanda’s president Paul Kagame and Kenya’s president Uhuru Kenyatta are regular Twitter users. But as in the US and other Western countries, there are concerns about the rise of bots spreading misinformation and sowing discord online. A recent report showed that there has been a marked increase in the influence of bots in African countries particularly around election seasons. US Embassy In Accra Embarrassed Over Twitter Blunder. Chibok Girls To Be Freed As Aso Rock, Boko Haram Reach Ceasefire Agreement.